We are serious about our social responsibility. We invest a great deal of time, resources and energy ensuring that our customers have access to a friendly and caring gaming environment, our employees and suppliers enjoy an ethical and rewarding workplace, and the wider community—including shareholders—benefit from our success. For 888, caring for customers means we not only provide great value entertainment but do it in a way that is safe, secure and fair. We want our customers to stay in control and enjoy their experience. We strive to ensure that those who are underage or potentially vulnerable do not get drawn into a gaming environment. Our approach to preventing problem gambling and keeping underage players away is underpinned by our cutting-edge technology systems and the expertise of our highly trained customer care team. 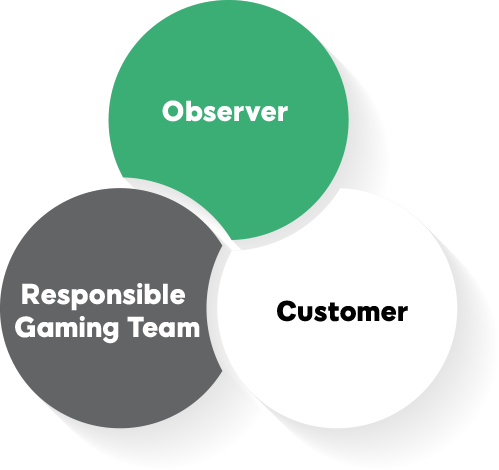 Through a three-stage process, our sophisticated Observer system monitors players’ activity, flagging unusual or concerning activity to our specialist responsibility team, who can provide the customer with information to help them make an informed decision about their gambling and, if necessary, select the right tools to control their play.